Posted on April 6, 2018 at 1:33 pm. The infamous ‘Bridge of Death’ between Hong Kong and Macau continues to draw criticism as its completion date draws near. Some 10 people have died on a project that has cost over US $15 billion. Furthermore, more than 420,000 tons of steel was used in a bridge construction that took nine years to complete. While the official inauguration of the bridge has been set aside for sometime later this year, the whole project is currently facing heavy criticism from both sides of the divide. The purpose of the bridge is to link Hong Kong and Macau over the Pearl River Delta. After its completion, travellers will spend only 45 minutes on a journey that once took four hours – a reduction of some 60 per cent. Payment for the bridge construction will be generated from increased gambling in Macau casinos. But critics, including principal planning manager Gao Xingling, have condemned the cost of both life and finances in building the bridge. Hong Kong lawmakers say as many as 600 workers have sustained serious injuries during the bridge construction. Fernando Cheung of Hong Kong’s Labour Party called it the “bridge of blood and tears”. “The project is known as the ‘bridge of blood and tears’ and we are only talking about the Hong Kong side,” Cheung said. In early 2015, the three contractors involved in constructing the bridge were fined over $20,000 each for negligence when a lifting frame with a “deficient design” collapsed and killed a construction worker, injuring four others. The three contractors are China Harbour Engineering Company, VSL Hong Kong and Dragages Hong Kong. 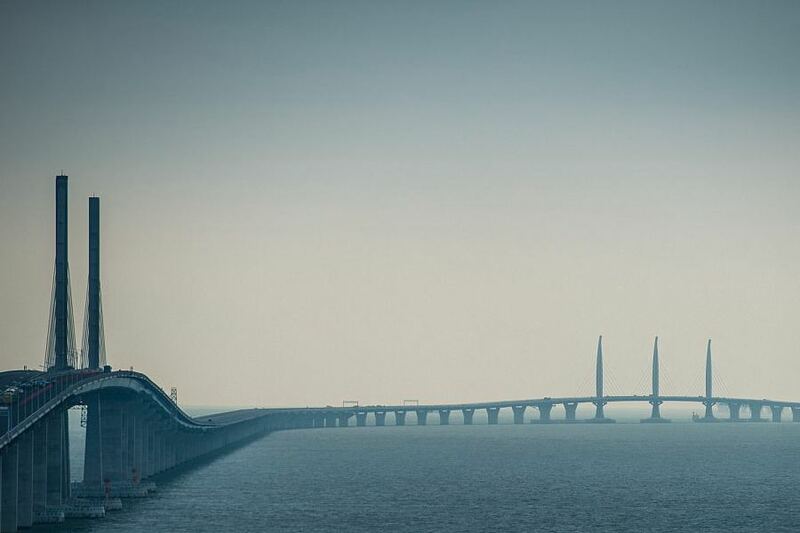 The six-lane bridge will be 34 miles long with a four-mile underwater tunnel. Planning manager Xingling said “linking the 80,000-ton pipes under the sea with watertight technology was the most challenging” part of the project.